All of your dossiers are organised by type of information and accessible from each of the dashboards. No matter what type of dossier you want to create, the process is always the same. To create a new dossier, simply navigate to the sub-dashboard you want. In this example, we will show you how to create a new dossier for a business agreement. To get started, select Contracts. From the sub-dashboard, click the blue button the left hand side to create a new dossier. 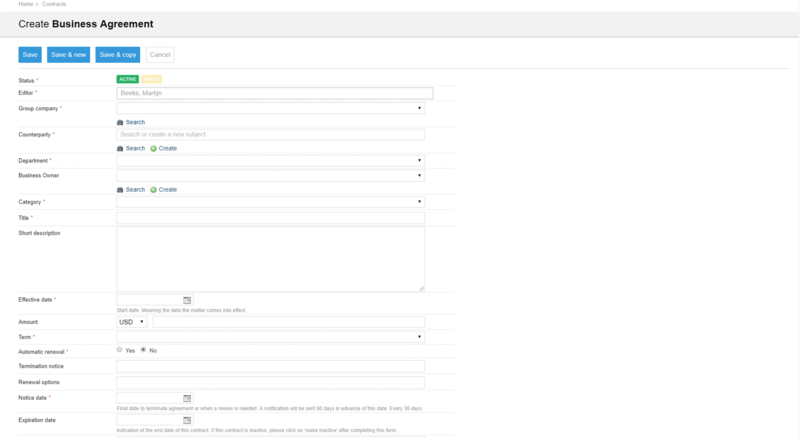 Once you click the button a form will appear to fill in all of your key information. The fields you see will be different depending on the dossier type you are creating. Once you have filled in all of the required fields, click on Save. All of the information you provided, is now quickly available, in the Factsheet tab of your dossier. You can also add notes, tasks, risks and documents to your dossier. Finally, you can manage the confidentiality of the dossier, by selecting the, Make Confidential, option. There you have it. Your dossier, with all the key information, is now safely organised in Legisway Essentials.